Banktivity 6.3.2 – Intuitive personal finance manager; widget available (was iBank). Banktivity (was iBank) is a new standard for Mac money management. With its intuitive user interface and a full set of money-management features, Banktivity is the most complete software available for Mac personal finance. It lets you enter and edit your transactions with ease, pay bills online and on time, download your online account data, reconcile your statements, and track your investments with versatile and robust tools. In Banktivity, it’s simple to split, schedule or categorize transactions. With a couple of clicks, you’ll be able to create powerful, dynamic reports using Banktivity’s flexible templates (Income and Expense, Net Worth, Forecast, and more). And Banktivity’s new envelope budgeting feature helps tailor your spending while building savings. Next story Snippetty 1.3.0 – Live presentation tool for code snippets. Previous story Awesome Mails Pro 3.0.2 – Create interactive emails. Chronicle 6.0.0 – Manage your billing cycles and payments. 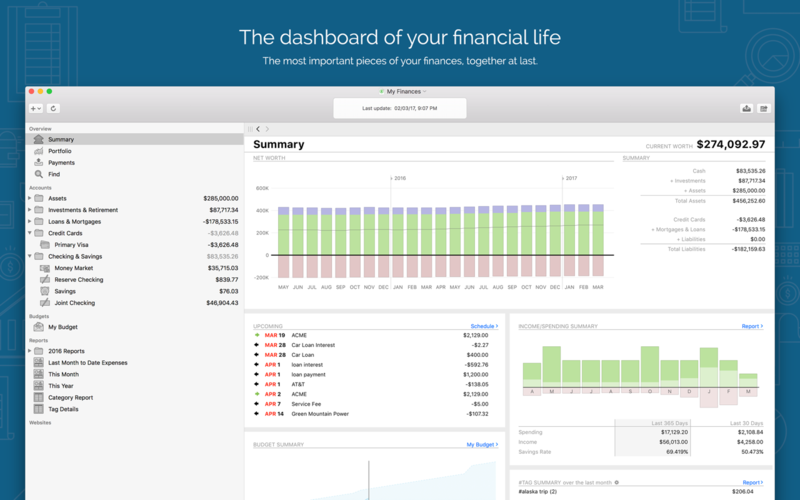 iFinance 4.1.5 – Comprehensively manage your personal finances. iCompta 6.0.11 – Manage personal finances.